North Korean Supreme Leader Kim Jong-un has reaffirmed his country’s commitment to “complete denuclearization” of the Korean peninsula, but offered few new pledges after hours of meetings with President Donald Trump. After the Singapore summit, Mr. Trump responded by announcing that the U.S. will suspend its so-called war games with South Korea. “The war games are very expensive, we pay for the majority of them,” he told reporters. North Korea has agreed to denuclearize, and would be “starting that process very quickly,” he said. But the text of a joint statement signed by the two leaders included no language on timing, nor did it mention the “complete, verifiable, irreversible denuclearization” that the White House has demanded. Instead, it merely reaffirmed the broad commitment to denuclearization that North Korea made in late April, after meeting with South Korean president Moon Jae-in. Other language in the document was similarly vague, such as establishing “new U.S.-DPRK relations in accordance with the desires of the peoples of the two countries for peace and prosperity.” Both countries agreed to “join their efforts to build a lasting and stable peace regime on the Korean peninsula.” Mr. Trump “committed to providing security guarantees to the DPRK,” without providing details of what those might be. North Korea calls itself the Democratic People’s Republic of Korea, or DPRK. Before leaving the summit site at a luxury resort early Tuesday afternoon Mr. Kim pledged that “the world will see a major change” after his meetings with Mr. Trump. “We had a historic meeting and decided to leave the past behind,” he added. The language used in the joint statement, however, differed little from what North Korea has used for decades — and remained far from the specific provisions North Korea agreed to in 1994, in an agreed framework on abandoning its nuclear weapons program. That was long before Mr. Kim had achieved his goal of attaining a workable nuclear weapon, in addition to long-range missiles that experts say should be considered capable of reaching North America. Mr. Kim’s success in meeting with a current U.S. president will do little to persuade him to lay down those weapons, experts believe. 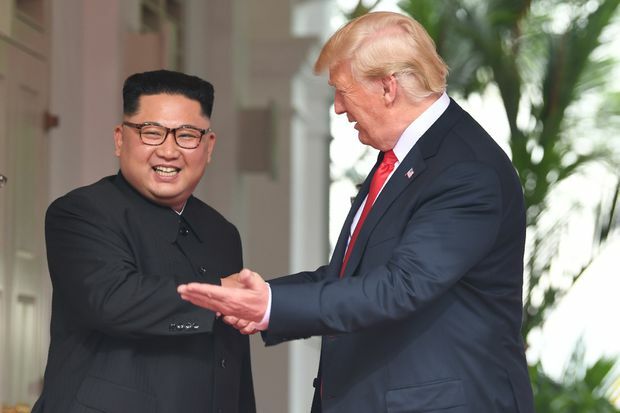 “Even if the statement contains language about an ultimate giving up of nuclear weapons, the fact is that Kim got to this point of appearing as an equal with an American President because he has nuclear weapons, and because that deterrent has solidified,” said Adam Cathcart, a lecturer at Britain’s University of Leeds who is founder and editor of Sino-NK, an online publication for academic discussion of issues around North Korea. “This is exactly the goal we have hoped for,” Mr. Wang said. In Singapore, Mr. Trump said he had “learned a lot” about the younger North Korean leader, who he described as “a very talented man,” not quite five hours after the two met for the first time Tuesday morning, exchanging a 13-second handshake that marked the first time sitting leaders of the two countries had come together. After a short outdoor stroll, the U.S. president and former reality television star then appeared to show off for Mr. Kim The Beast, the heavily-armoured Cadillac that is the presidential car. Mr. Trump said he would invite Mr. Kim to the White House. Both men appeared to revel in the making of historic images, smiling and repeatedly shaking hands. Mr. Trump at one point gave a thumbs up to Mr. Kim, a dictator whose regime is accused of committing unspeakable atrocities against its own people. We gave up a lot for nothing. There was no indication that North Korean human rights had been discussed, on a day where Mr. Trump sought diplomatic advancement through bonhomie. The two men spoke privately before a backdrop of red, white and blue flags, North Korea’s single star interspersed with the stars and stripes of the American banner. “The friendly greeting suggests that both Kim and Trump want to have a good meeting that sets a positive tone for the difficult negotiations to come,” said Michael Kovrig, senior adviser for North East Asia with the International Crisis Group. The seemingly warm exchange between Mr. Trump and Mr. Kim on Tuesday was particularly striking, coming just days after a public clash between the U.S. president and Canadian prime minister Justin Trudeau. Still, he said, Mr. Trump’s aim with Mr. Kim was clear: to build trust by creating a personal bond. “If you’re friends, then you don’t have to arm yourselves and point weapons at each other,” he said. The hope is Mr. Kim will then, in the spirit of amity, sign on to the much tougher work of abandoning his nuclear arms. But Mr. Trump has proven a difficult leader to trust, abruptly pivoting with little notice. And the smiles on Tuesday “don’t mean anything” unless they are followed by specific commitments to make change in North Korea, Mr. Pinkston said.